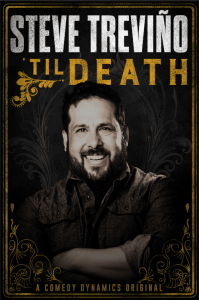 Comedy Dynamics will release Steve Treviño’s new comedy special, ‘Til Death, on January 22, 2019 – premiering on iTunes, Google Play, Amazon, Xbox, the Comedy Dynamics Network and other cable and satellite providers. The album will be released on all digital audio retailers January 25, 2019. In his latest special, Til Death, America’s favorite husband, Steve Treviñogives us a bitingly honest take on the day-to-day joy of marriage, kids, and living life with your best friend. “I’m so proud of this special. We filmed this thing in a barn and I worked really hard to make it happen in Texas the way I wanted to. It’s really authentic to me. I’m trying my damnedest to break the stereotypical image of the Mexican American that Hollywood perpetrates in the media. And I feel like ‘Til Deathaccomplishes that by painting a picture of my family. These are stories from my life. They’re universally relatable regardless of race. I express my frustrations with my marriage, but at the heart of it, ‘Til Deathis really a love story,” said Steve Treviño. Steve Treviño is fast becoming one of the country’s hottest comics and the new voice for the 21st century Mexican American. Finding his way from a Hispanic upbringing in a small South Texas town to living his dream in Hollywood has infused Treviño’s comedy with a “TEX-MEX” sensibility. Yet as a performer, he has a uniquely American voice that transcends ethnicity, making him universally relatable. Outside of being a national headliner, Treviño has made memorable appearances on The Late Late Show, Comics Unleashed, and many others. He also wrote on Mind of Menciaand produced and wrote on rapper Pit Bull’s La Esquina. Treviño landed in the Nielsen Top 20, with his 1st Showtime comedy special, Grandpa Joe’s Son. His 2nd special Relatableaired on Netflix.